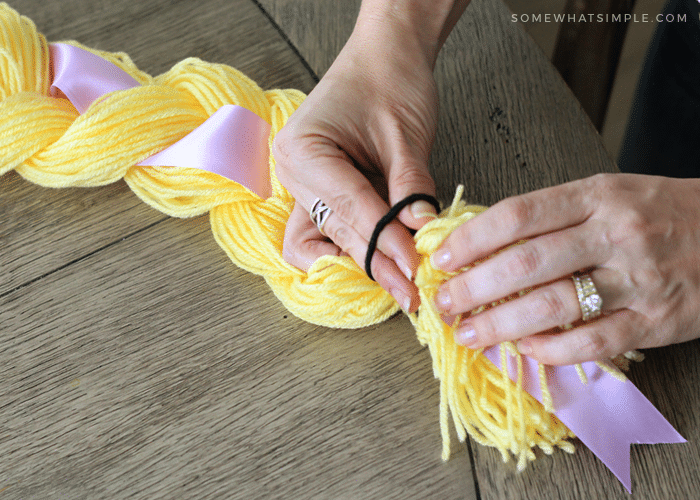 How to make an easy Rapunzel Wig that’s perfect for your little Tangled-loving princess! 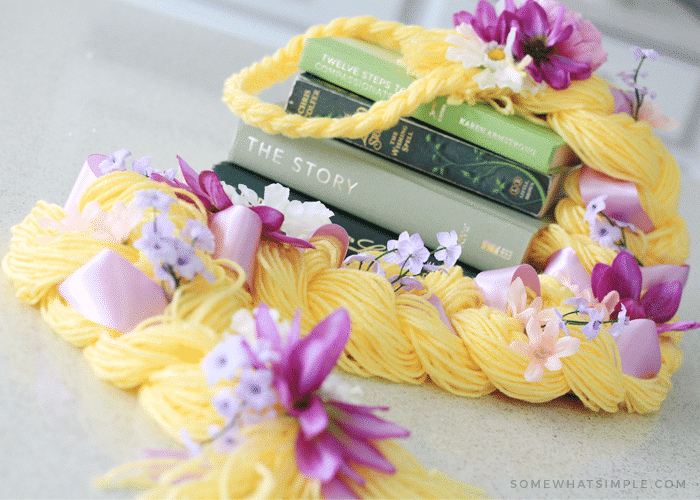 My sister in law made one of these Rapunzel wigs for her daughter and it was too darling of an idea not to recreate for my own little Tangled fan! 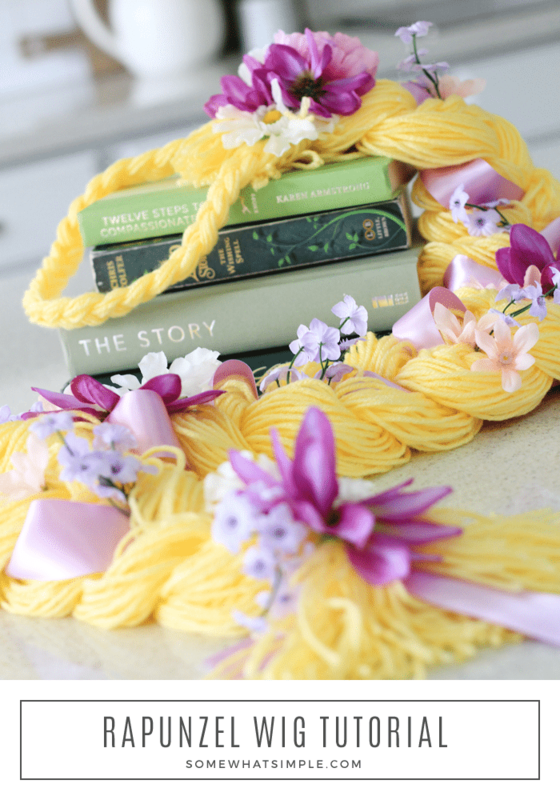 I’ve made a couple more since then – they are not only great for a Rapunzel Halloween costume, but they make great birthday presents or additions to your dress up box! 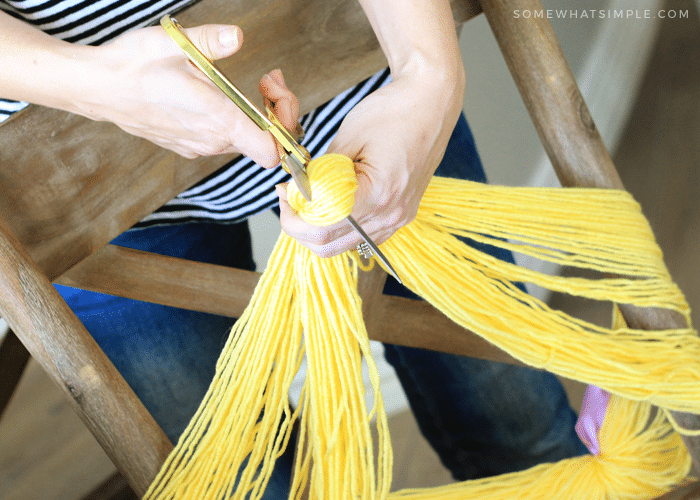 Here is how to make your own with a few tips and shortcuts that should help you make your own in one hour or less! * I’ve used both a cushion from a chaise lounge and 2 chairs spread apart to the length I want my hair. You could use your kitchen island if it’s the right length too! 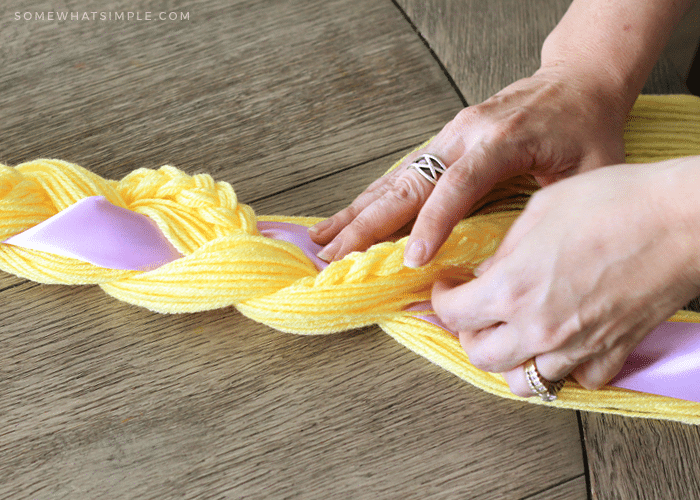 Wrap the yarn around your object(s) until you get to the very end of the roll. 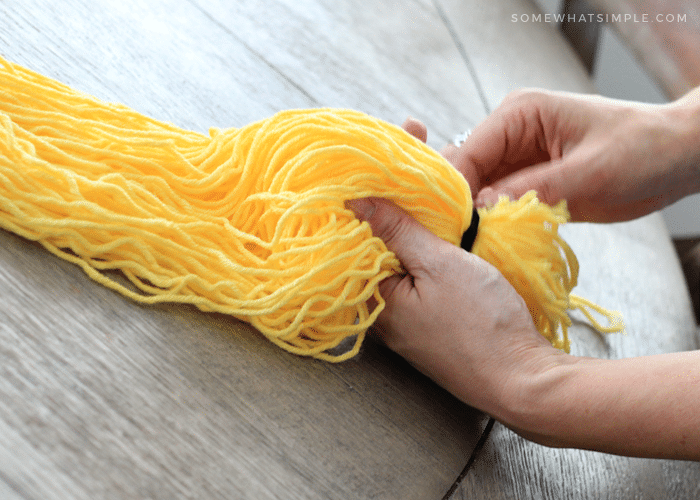 Tie the middle together and then cut the yarn on opposite sides of the object you chose to use to form one long pile of hair. Lay the pile down on a flat surface. 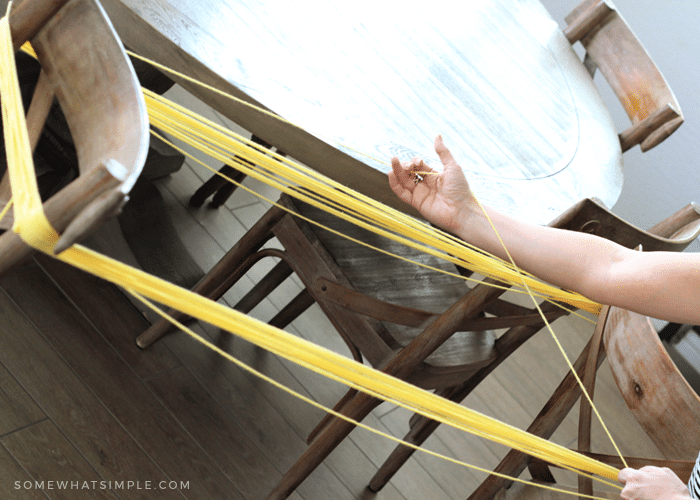 Secure the top with a hair elastic. 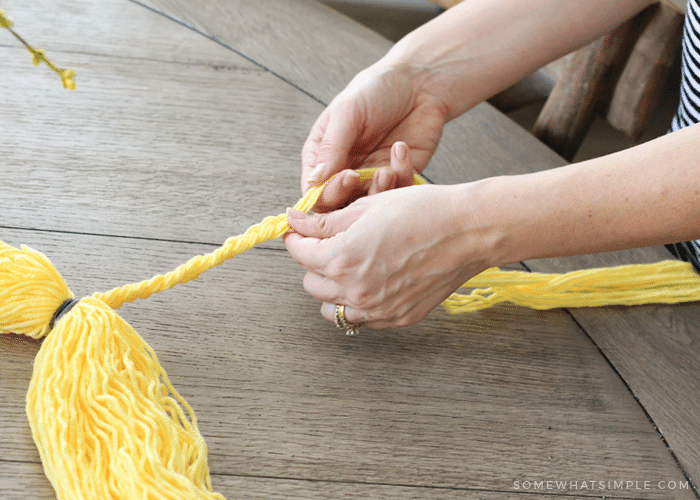 Take a small chunk of the yarn and braid it. 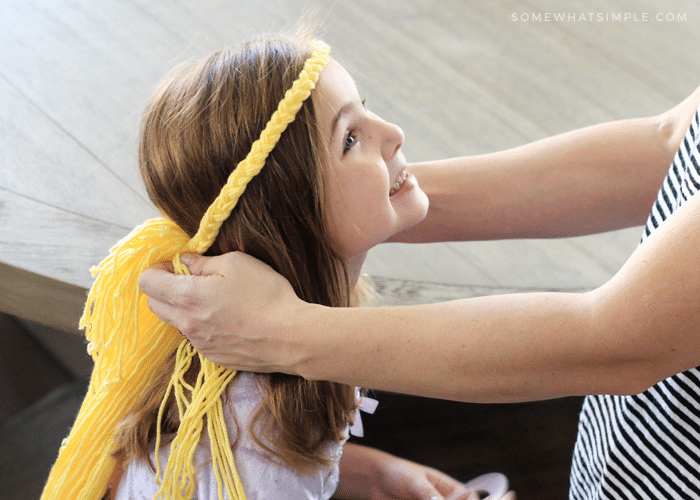 This will be the braid to go around your child’s head. 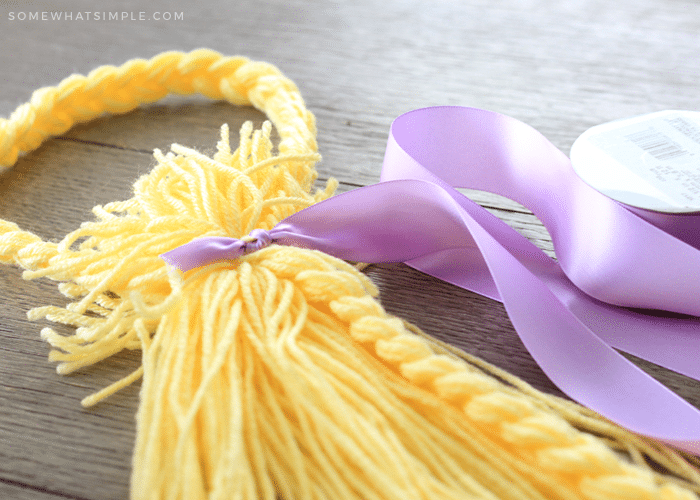 Measure around your child’s head, and secure the end into the hair elastic. 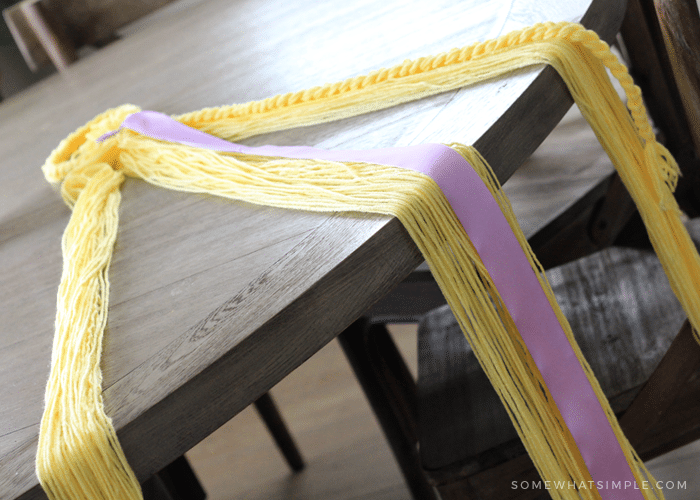 Tie your purple ribbon to the elastic hair band, then cut to the length of the rest of the yarn. 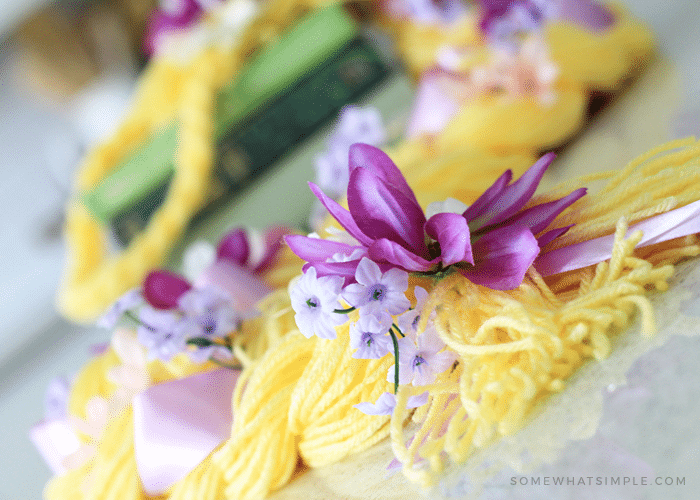 Braid the remaining pile of yarn + ribbon. Secure it with another rubber band at the end. 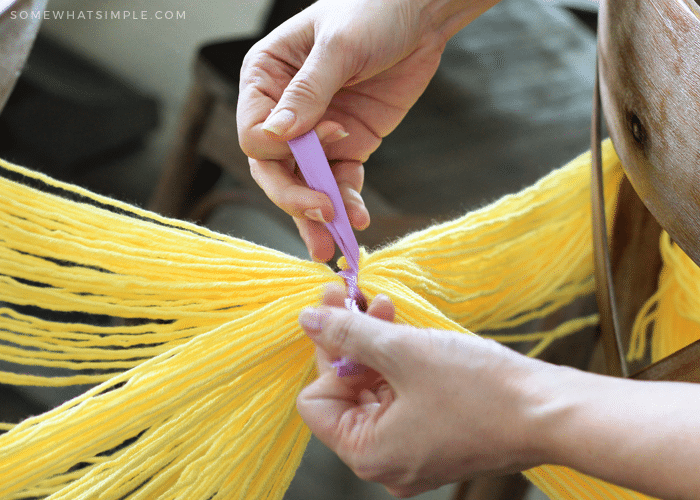 It helps if you have 2 people doing this, otherwise your yarn will get really “tangled.” (No pun intended) You can do it with one person, it is just a longer process. 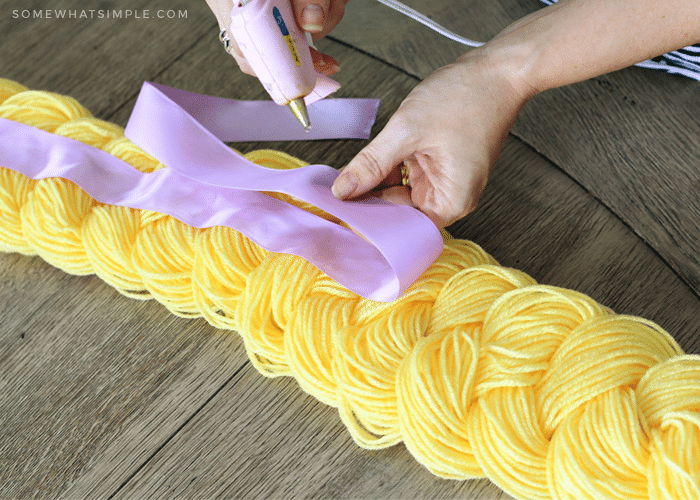 For a thicker-looking Rapunzel braid, you can scrunch the braid just a little and secure it by hot glueing a ribbon to the backside to keep the scrunched yarn in place. This is totally optional! 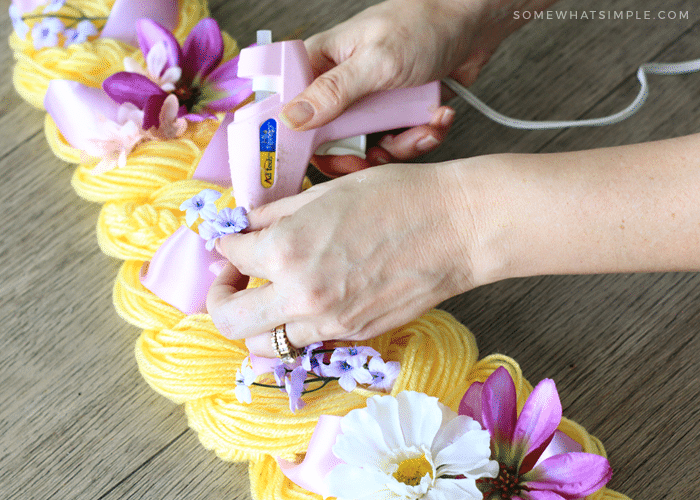 …and then hot glue into place! 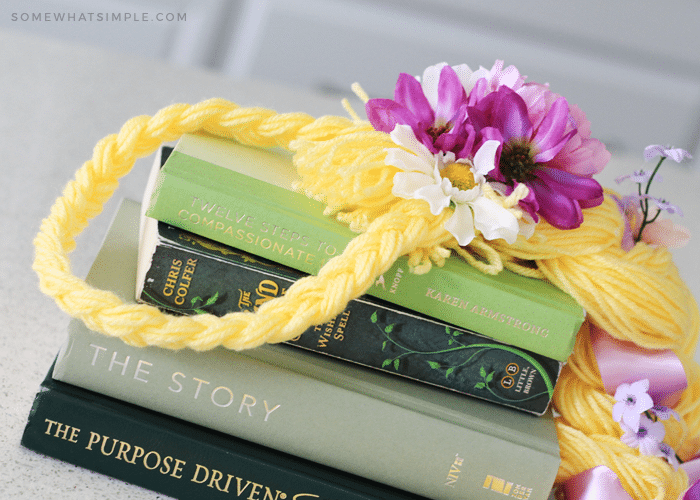 So easy, and so adorable! 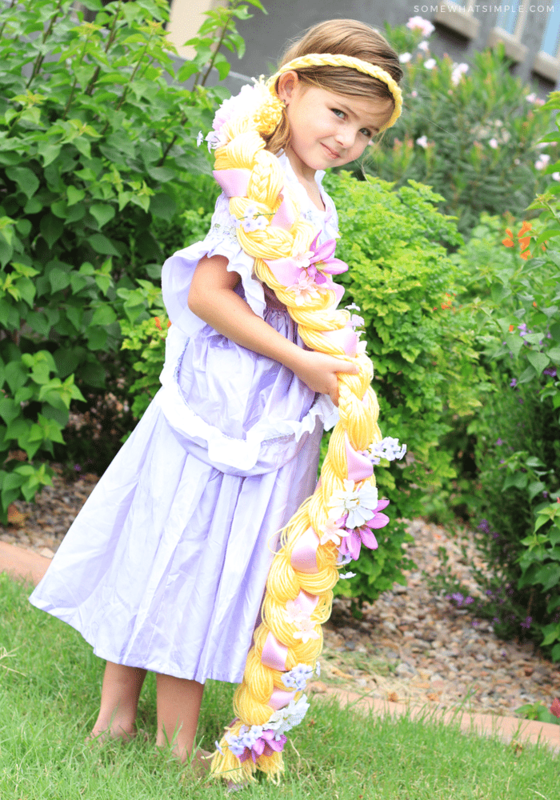 A simple Rapunzel wig, perfect for your little princess! Did you make this? We want to see! 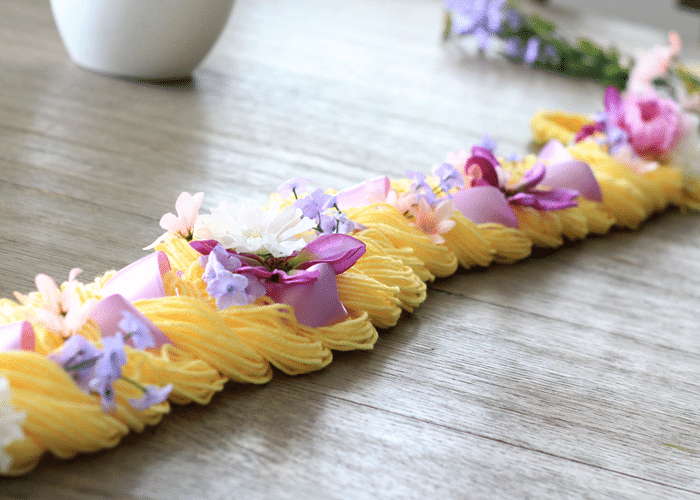 Tag us on social media, or email us with your Rapunzel wigs pictures! 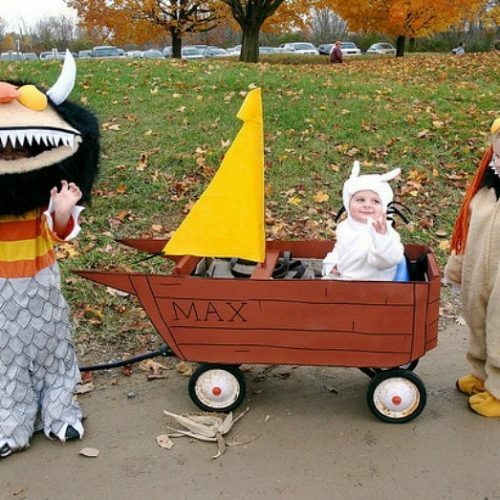 This post originally published in September 2010. It was updated in October 2018. 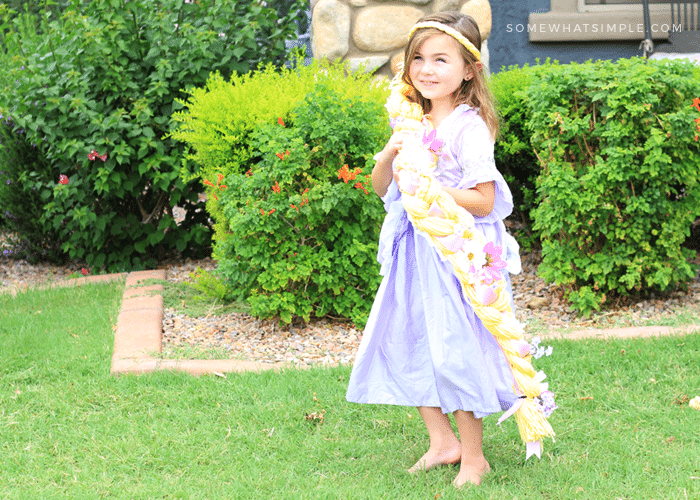 My almost three year old wants a Rapunzel birthday party, so this is perfect! 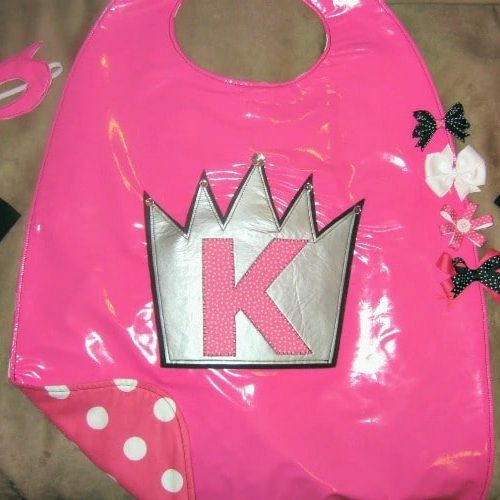 such a cute and easy idea! thanks for sharing! We were in St. Paul over the weekend and my little lady saw a smoke stack and thought it was Rapunzel’s tower. It was too sweet to correct her. I have been debating whether or not she is too little to watch Tangled, but apparently she already knows the storyline. Cest la vie. bah i love it! 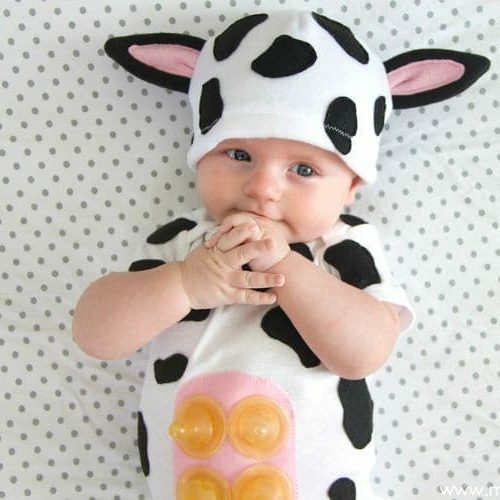 soooo stinkin cute!! !